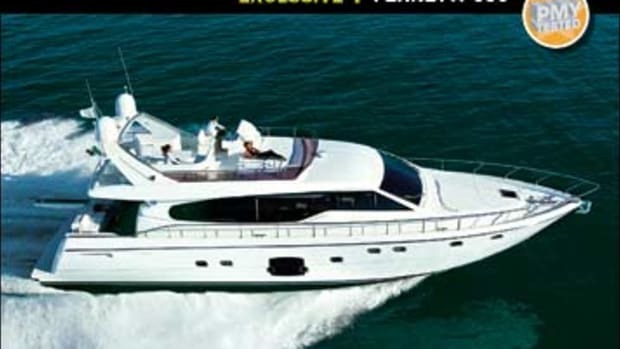 When I stepped aboard the Ferretti 590 in early March, it had been nearly nine years since I&apos;d tested my first Ferretti for PMY&apos;s May 1994 issue. While this boat&apos;s sleeker, curvaceous exterior stood in sharp contrast to the angularity of the 185 Fly&apos;s—a motif that was then the Euro rage—I was nevertheless impressed by how similar the two boats were and how little had changed in nearly a decade. Perhaps the most obvious commonality was the superb joinery and flawless lacquer that marked both interiors. I&apos;m not speaking of only pretty wood with a perfect finish—it&apos;s also about the careful selection of wood, precise matching of grains, and joints that are so tight they&apos;re essentially invisible. For a long time Europeans-—specifically the Italians and the English—have seemed to have a lock on this art, at least within the production-boatbuilding realm. American boatbuilders are catching up but still, in my opinion, lag behind, many contending that the deficit is the result of more stringent environmental regulations here that prohibit the use of some of the glossiest coatings. Europeans say it&apos;s simply fine craftsmanship that has been handed down from father to son for generations. Whatever the reason, the moment you enter the 590&apos;s saloon, you can&apos;t help but notice the tasteful blending of light and dark cherry and cherry burls and a finish that seems a foot deep. You might be so impressed by it that you miss thoughtful touches like the bank of circuit breakers readily accessible to the helmsman on a panel to port of the lower helm. Chances are you will not miss the decidedly European galley-down arrangement—the 185 Fly, strangely, had the more American-friendly galley up. This one is well equipped, if a bit remote from the saloon, and has a laundry room (the washer, dryer, and separate freezer are a $10,780 option) to centerline of it that extends under the lower helm station. In Europe this space is devoted to crew&apos;s quarters, and in fact, the crew&apos;s vanity sink remains to port. Yet another continuum among Ferrettis of all vintages is scintillating handling. 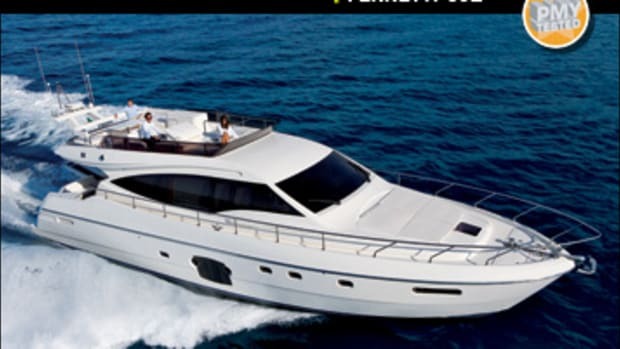 In a world of stylish European and European-inspired yachts, a Ferretti stands out as a driver&apos;s boat. In fact, if you hire a captain for your 590, you&apos;ll be missing out on a lot of fun. Perhaps it&apos;s because of the company&apos;s racing heritage that the 590, like the 185, feels so good at the wheel. Other yachts offer more headroom—the 590&apos;s saloon measures less than 6&apos;4" vertically—but in trade, the boat gives you a relatively low center of gravity that helps her maintain trim, even in a beam sea, and remain firm-footed in the tightest turns. 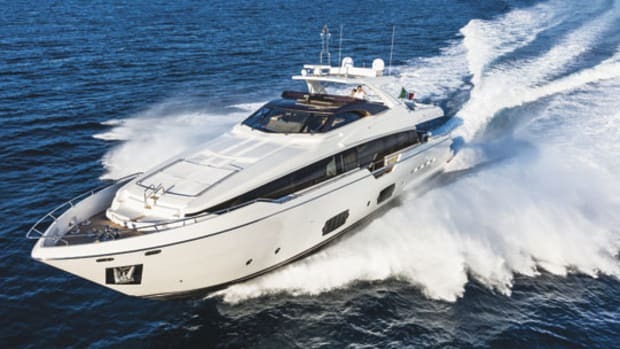 Power steering was a Ferretti standard back in 1994 and continues to be today, making the 590 quick to respond to wheel input. When I wrote of the 185 Fly, "Acceleration is surprising for a boat of this heft, and she turns like a sportboat," I could have just as easily been writing about the 590. In fact, our test boat was responsive in just about every way but one: I was surprised to discover that trim tab adjustments produced little, if any, discernable change in running attitude. Under normal circumstances this should present no problem, as the 590&apos;s weights and balances have been well attended to. It might be another matter if one has to contend with uneven loading or a stiff wind on the beam. 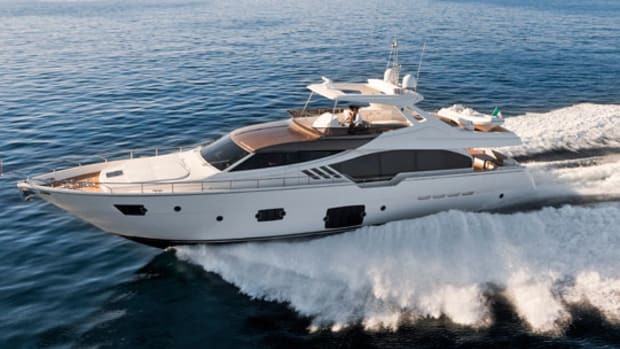 Another reason for Ferretti&apos;s trademark performance is careful attention to weight through, among other things, judicious use of advanced laminates like Aramid. In fact, it appears that over the years Ferretti has done an admirable job of maintaining displacement while adding a lot of gear. With an LOA of 57&apos;10", the 185 Fly had a listed full-load displacement of 70,780 pounds, while the 590, at 59&apos;8" nearly two feet longer, is said to tip the scales at 71,663 pounds. Good weight control helps explain why the newer boat is faster (37.6 mph versus 35 mph) with nearly identical horsepower (1,050 hp versus 1,000). 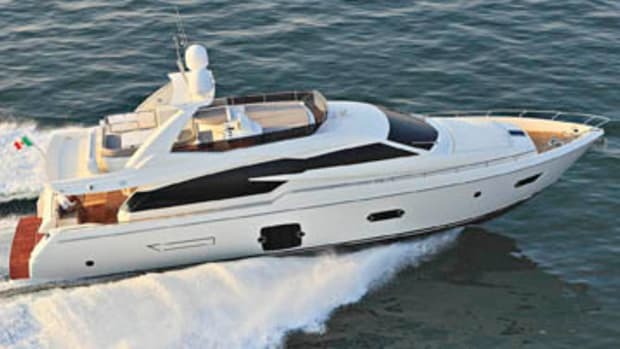 Acceleration is brisk as well, due in large part, I think, to Ferretti&apos;s preference for V-drives (in both the 185 Fly and 590), which places the engines&apos; mass farther aft for better on-plane performance. Adding to driving pleasure, the flying bridge offers, as you&apos;d expect, excellent sightlines, but the standard lower station is its equal, if not superior. Thanks to a single narrow mullion, the helmsman below has a fine view forward, from the forepeak back to beyond amidships. There is a blind spot on the starboard aft quarter, but there is a full view aft, making docking much easier. Speaking of which, I was surprised to learn that a bow thruster is a nearly $15,000 option—I can&apos;t imagine anyone today ordering this boat without one—and while I&apos;m kvetching on that subject, I&apos;m also surprised that air conditioning is optional ($42,075). 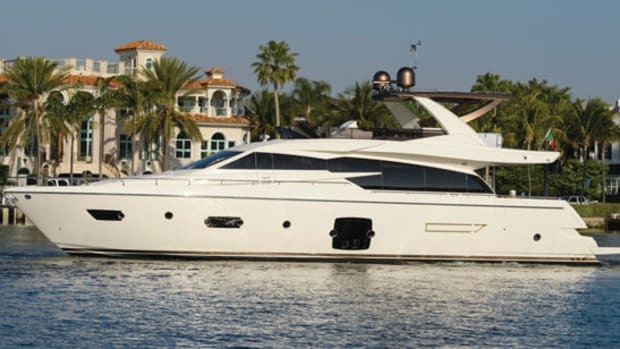 Most of the door hardware and plumbing fixtures aboard the 590 are different from the 185&apos;s, yet on both they are unreservedly upscale, another Ferretti trademark. Both boats also offer two features that, amazing to me, no one has yet copied, at least as far as I know. I&apos;m speaking of the innovative flip-up glass panel in the aft bulkhead that opens the saloon to the aft deck and the elegant chrome and glass cockpit table that folds flat and hangs off this same aft bulkhead. Of course, much has changed, too, especially in the area of space planning. While the 185 Fly managed only one queen-bed stateroom, the owner&apos;s in the forepeak, the 590 has two, a much roomier midship master and a forepeak VIP. The VIP is nearly the size of the port-side master, which is able to handle an athwartships queen-size berth because the lower-level companionway is offset to starboard. Both master and VIP have large en suite heads with enclosed showers. The big surprise is the relatively roomy starboard guest stateroom, which has side-by-side berths and generous headroom—well over six feet. It, too, has an en suite head with shower (the whole space is a shower) that, thanks to a second entrance, doubles nicely as a day head. 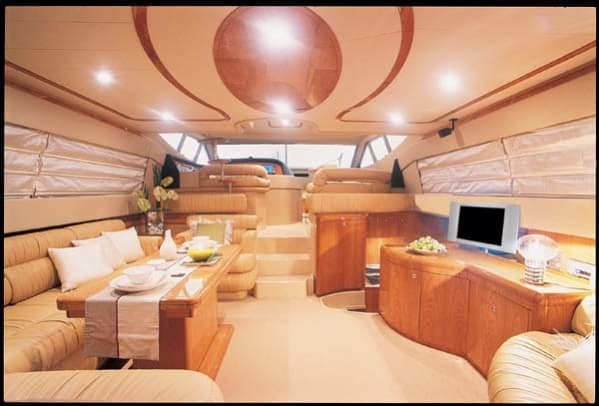 To get all this space, Ferretti designers fudged just a bit on the companionway width, although at two feet it&apos;s hardly narrow. Other changes include the standard wood. 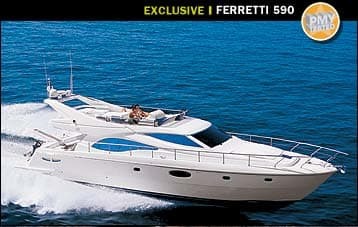 On the 185 Fly it was mahogany, which Ferretti abandoned some time ago in favor of the lighter, brighter cherry. The standard engines are now MANs instead of MTUs, and the newer boat&apos;s engine room is considerably roomier than the old boat&apos;s, on which even routine work required some contortions. But perhaps the two biggest changes I noticed over nearly a decade are not on the boats at all. 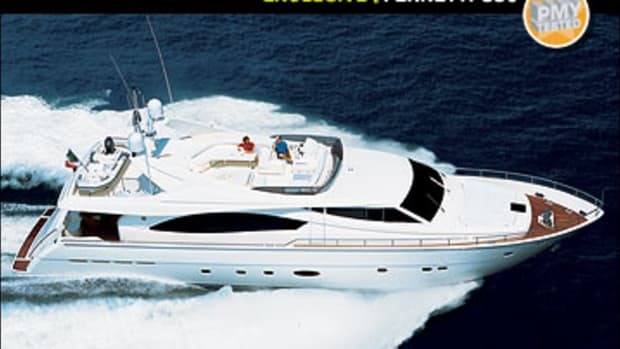 Back in 1994 Ferretti was a relatively small, if ambitious, Italian builder that had just begun to test the waters of the market in the United States. Today it&apos;s not just Ferretti, but part of The Ferretti Group, a conglomerate of seven companies that comprises one of the world&apos;s boatbuilding powerhouses. More important to boaters, with all that size has come a lot of resources, especially regarding service. Nine years ago service and parts were understandably much less crucial to the company, as there were few Ferrettis on this side of the Atlantic. 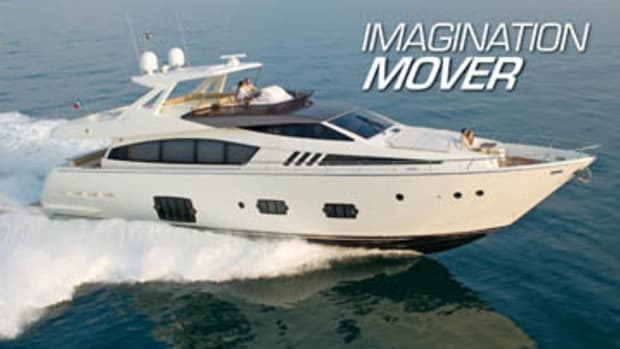 Today Ferretti Group USA is a fully autonomous part of the Ferretti Group that provides what the company calls "U.S. factory support on a personalized level." This includes dedicated service personnel, a complete inventory of parts stocked in a dedicated stateside warehouse, and product managers whose sole task is to ensure customer satisfaction. 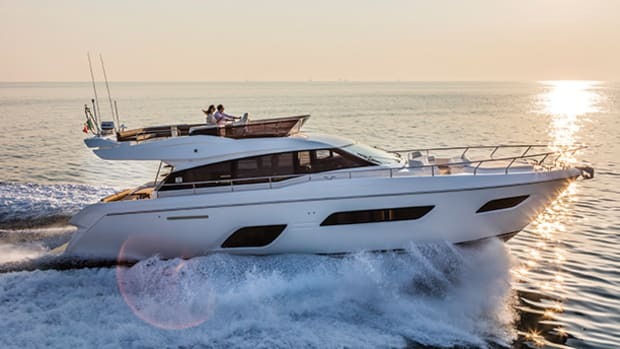 Ferretti has come a long way in less than a decade, but it clearly hasn&apos;t lost sight of what made it such a success, namely high style, top quality, and exciting performance. Makes you wonder what the 2012 Ferrettis will look like.